Reviews & Interviews Editor Jackie Hedeman on reading (so, so many) books outside this summer. My approach to summer reading is best described as Catholic Guilt meets All You Can Eat Buffet. I attempt to make up for the disappointing trickle of mid-semester pleasure reading by going on a rampage. Do I distinguish between fried chicken, broccoli, and chocolate-dipped strawberries? Only in terms of whether they fit on my plate, by which I mean: in my tote bag for a walk, in my carryon for a flight, on my Kindle as one of the ten checkouts permitted by the Columbus Public Library. So I’ve been reading YA. Middle-grade. Essays. Comics. Memoir. Plays. Excruciatingly realist fiction. Horror. I read nearly every book outside. Reading outside is what elevates summer reading from summer pleasure to summer joy. (In my case, this involves nail polish-stripping sunscreen and a mental list of shady benches.) I read outside in Columbus: on the OSU oval, in tiny Miller Park in Upper Arlington, at outdoor tables at Stauf’s and Starbucks, in the arboretum. 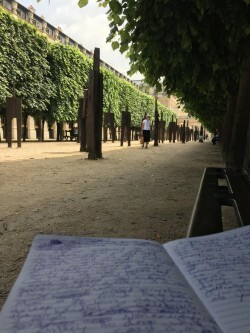 I also read outside in Paris: in the Jardin des Tuileries, in the Place des Vosges, at the foot of the Eiffel Tower, in the Luxembourg Gardens, at Versailles, and in the Jardin du Palais Royal, which happens to be my favorite place on earth. Here’s why the Palais Royal is my favorite place on earth: balance and harmony. There’s the crunchy gravel and the regimented shade trees and the sky. Every time I visit, there are the same green metal chairs and the same workers taking lunch. It’s a historical attraction in the center of tourist Paris, but it’s quiet. You can’t stay forever—there’s nowhere to buy cheap food, nowhere to pee—but you can stay long enough.